Use this link every time you shop and Amazon makes a donation to the school. This option donates at a higher rate than AmazonSmile!! Check to see if your employer has a matching gift program and increase your donation! 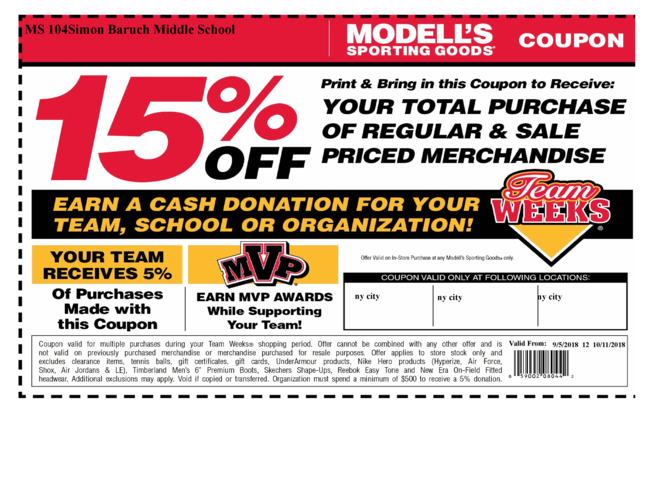 Modells is offering 15% discount on your total purchase if you present this coupon upon checkout. The school get 5% back on all purchases made using this coupon. Drop your box tops at the main office and we'll do the rest. Use this link to request a label. Only like-new items, please!! Get weekly updates from the MS104 PTA. Parents/guardians may now receive texts from the school. Please opt-in by texting "Y" to 67587 from each device on which you wish to receive SMS text messages. Please check MS104's calendar at www.104m.org to stay updated on events. Please see the 2018/2019 NYC DOE calendar for other important dates.